Camping, BBQs, hiking, rock climbing, swimming, bike riding, 10-pin bowling … these are just a few of the exciting things you can do when you join the Sutherland Christian Cadet Club. 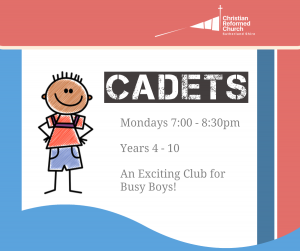 Boys from Year 4 to Year 10 are invited to join this club that falls under the Australian Christian Cadet National Organisation and the NSW state Cadet board. Run by volunteers, the Christ-centred club endeavours to develop in boys an understanding of their own gifts, God’s world and environment, and the Word of God from the Bible. Cadet activities include Bible studies, badge work and outdoor activities. 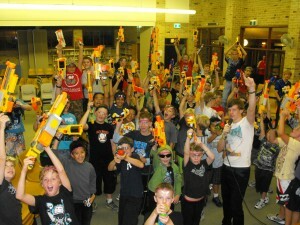 Boys have fun while being challenged to be physically active and try new activities. All this is done while honouring our Creator and Saviour Jesus Christ. We expect all Cadets to respect God, their leaders and fellow Cadets at all times. Wearing a special shirt as our uniform makes being a “Cadet” all the more important and special! All our leaders are registered through the denominational child safe organisation and adhere to their policy’s and recommendations. Please contact any of our counsellors, if you have any questions, or if we can assist in any way. See the Cadet Photo Gallery Here.